This year has been such a good year for us, a lot of things has happened as well but out of that series of incident came shower of blessings too. As most of you know, my fiance and I have moved into a new home with a studio attached to it; that has become the home of The Artsy Craftsy now where we host workshops, run classes and art jams, and also a place for us to start our production line and continue T.A.C Shop. Furnishing this place has become a joy to me because every now and then, I would try to find secondhand pieces and old what-not to decorate this little space. It has to have a flow of creativity, and that's how I started looking into secondhand furniture. Personally, I think that despite creating a modern and trendy space, the touch of a revamped and refurbished furniture makes a space even more artistic. After all, if I am going to be running an artsy space, why not be crafty with the decor and furnishing. 1. I started off with dry brushing the shelf. I used a Dulux Satinwood white paint, just a small can would do. A heads up, if you are planning to do this, a lot of brushes will be sacrificed so make sure you get a couple of brushes just in case. Dry brushing wasn't difficult. All you need to do is make sure you do not paint the shelf with an over excess of paint on your brush, otherwise the whole "messy" effect will not happen. 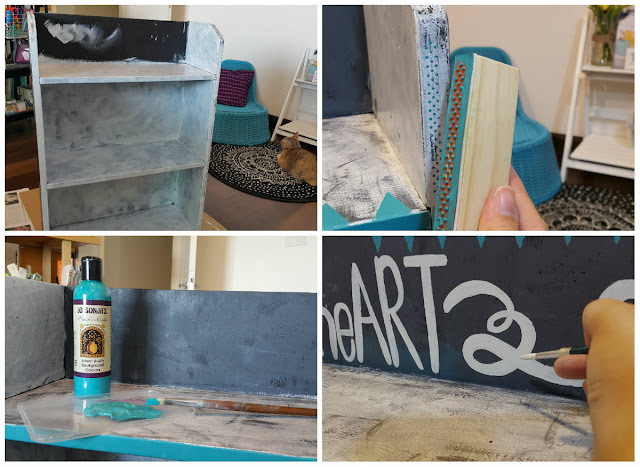 I also painted the side of the shelf with some grey paint. I didn't have any lying around, so I mixed the paint with some left over chalkboard wall paint. I like how it turned out. 2. I wanted some patterns, but didn't want to over do it. So, I use a rubber stamp with little dots, and stamp the sides with a nice turquoise colour. 3. The same turquoise colour was used for the edge of the shelf with triangle patterns. I love it! Very hipster, yet TYPO-ish design. 4. 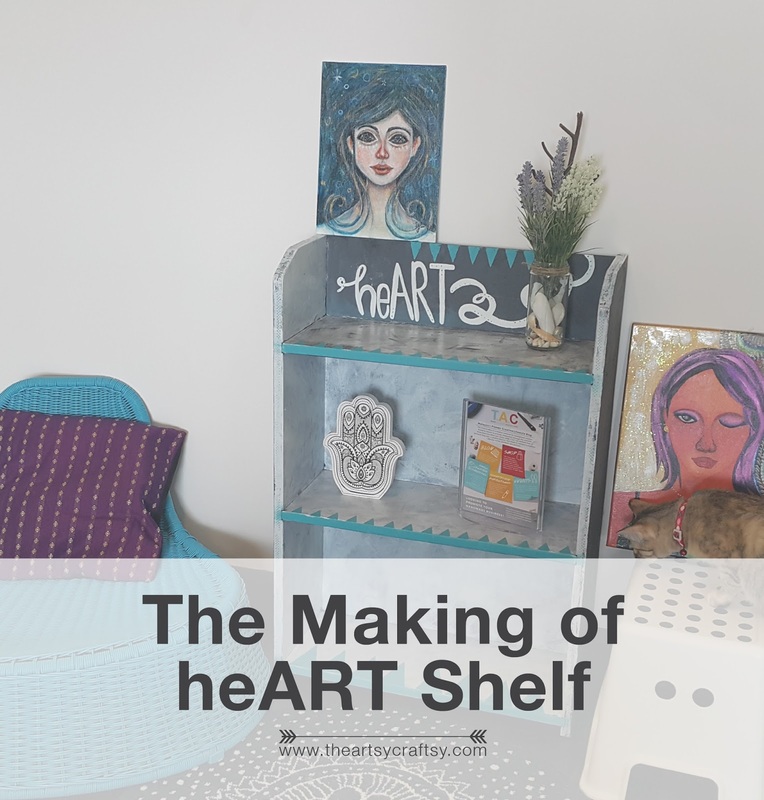 Finally, I used white acrylic paint to write 'heART' on top of the shelf, with a swirly pattern just for fun! 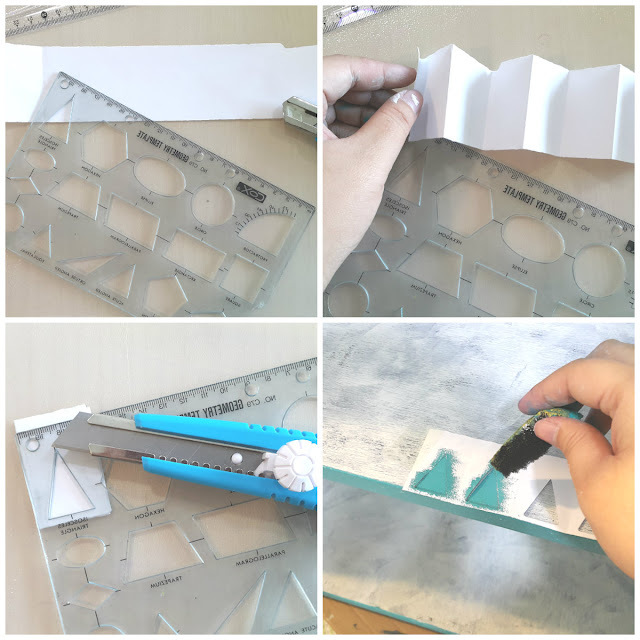 In case you are wondering how I did the triangle pattern, here's a quick guide on how to make your own stencil. Cheapest and fastest way! 1. Get a strip of paper, and prepare a blade and geometry template. The old school ones are the best because you can create patterns with it! The paper doesn't have to be anything fancy, just use recycle paper would do. 2. Fold the strip of paper accordion style. 3. You can trace the triangle (or any shape you want) with a pencil first, or just go right ahead with it like me. Cut it with the blade immediately, and make sure you cut it deep so that it cuts through properly. 4. Open it up, tape it to your surface. For stenciling, use a sponge to apply paint. There you go! The before and after. 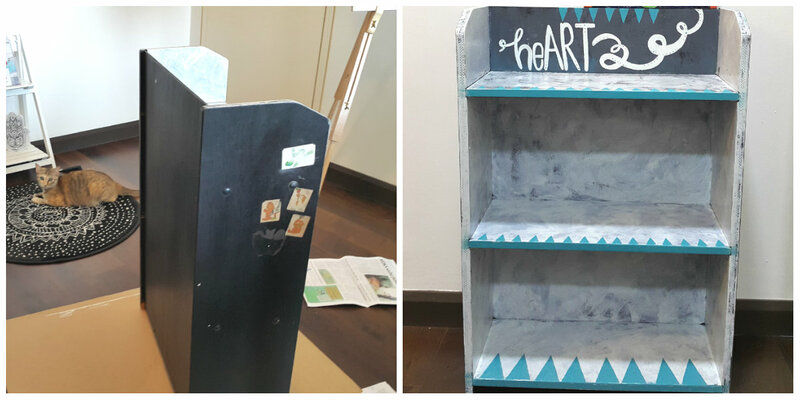 I wished I took a clearer picture of the shelf before it was painted, but I guess I was overexcited about it haha! Moving to a bigger space has made this possible. I enjoy furniture make overs so much that I am already thinking of what's next! More to come. Have you done a furniture make over? Tag us at #theartsycraftsy on Instagram.